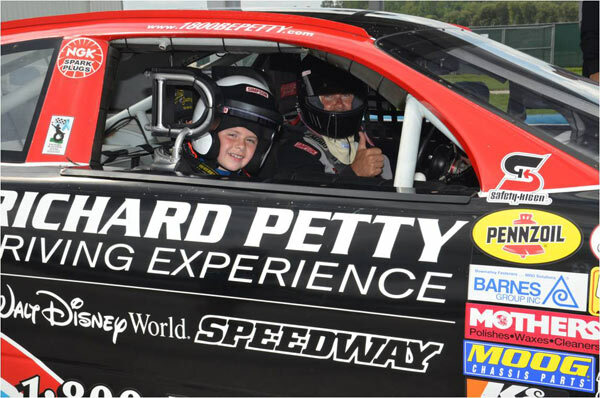 Junior Ride Along- A NASCAR Ride for Kids! It's a NASCAR Ride Along just for kids! Too young to drive? Kids can now take a Junior Ride Along! Kids can ride shot gun in a real NASCAR race car! Junior is in good hands as they take a 3 lap Junior NASCAR Ride Along at fast speeds with a professional racing instructor driving around the Charlotte Motor Speedway and the Daytona International Speedway. The Junior Ride Along is a ride like no other your child has ever experiences! What a GREAT Experience for the kids! The Junior Ride Along is for kids. Must be 4ft-5ft tall. Offered at Charlotte Motor Speedway and Daytona International Speedway only. Make a Reservation for a Junior Ride Along!